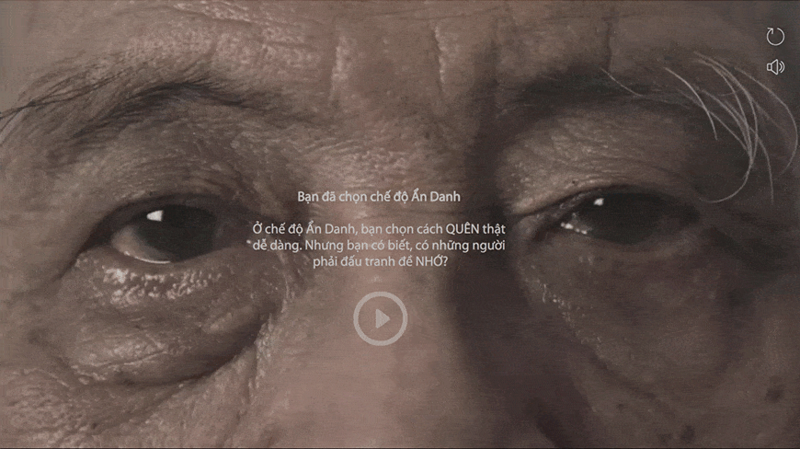 Cốc Cốc, Vietnam’s leading internet browser with more than 22 million monthly users, has introduced “The Forgetting Tab”, a creative campaign conceptualized by Isobar Vietnam to increase awareness of Alzheimer’s disease amongst Vietnamese. It uses Cốc Cốc's existing incognito mode to call attention to the forgetfulness that characterizes the disease. When using incognito mode, or private browsing, the pages viewed do not stick around in the browser history, cookie store or search history after the tab is closed. Essentially, they are not remembered. Cốc Cốc has renamed their private browser “The Forgetting Tab” and is presenting users who want to surf incognito with an emotional message (via film) about Alzheimer's, in the hope of bringing people’s attention to this serious, life-debilitating disease that affects not just the patients but also their caregivers. Users could then click through to learn more about the disease and care. The film was scripted and produced by Isobar Vietnam with the help of production company, Yeti Films, and directed by award-winning Tibetan filmmaker, Tsering Tashi Gyalthang. But why “The Forgetting Tab”? The reason is simple: for some users of Cốc Cốc, it’s their choice to forget, but for Alzheimer’s patients, they have no chance to remember the precious things or memories they’ve had in their life. The Forgetting Tab is a project which reminds people to help those who forget, to learn more about the disease and to be more sympathetic to those who suffer from it. Despite almost half a million* Vietnamese currently suffering from Alzheimer’s, awareness of the disease and its symptoms is still very low. Given there is a stigma associated with the disease, many sufferers usually do not seek treatment or admit to having it, therefore there is a possibility that the numbers of sufferers could be much higher. Cốc Cốc also hopes to encourage more sufferers to come forward and seek treatment as a way to slow down the debilitative process of Alzheimer’s, and give more precious time to them and their families. The Forgetting Tab was launched on April 29, 2017 and a media campaign designed by Isobar is currently running till the end of June 2017. Planned media activities include web and video banner ads, keyword search ads, browser skin and PR (across 30 leading Vietnamese media channels and platforms). The campaign has been well received in its first week with 729,078 media impressions, 8,818 click-through and 380,730 new browsers installed. To view the film in English, click here. To download the Cõc Cõc browser and view the film in Vietnamese, click here.